Heat oven to 350°F. Spray 13x9-inch pan with cooking spray. With floured fingers, press dough evenly in bottom of pan to form crust. Bake 14 to 16 minutes or until light golden brown. Sprinkle marshmallows over crust. Bake 3 minutes longer or until marshmallows are puffed but not browned. Meanwhile, in large bowl, mix popcorn and peanuts; set aside. In medium microwavable bowl, microwave peanut butter chips, corn syrup and butter uncovered on High 1 to 2 minutes, stirring every 30 seconds, until melted and smooth. Pour over popcorn mixture; stir to coat completely. Immediately press mixture over marshmallows in even layer using back of spoon. In small microwavable bowl, microwave chocolate chips uncovered on High 1 minute to 1 minute 30 seconds, stirring every 30 seconds, until softened and chips can be stirred smooth. Drizzle melted chocolate over bars. Cool on cooling rack 1 hour. Refrigerate 30 minutes or until set. Cut into 6 rows by 4 rows. 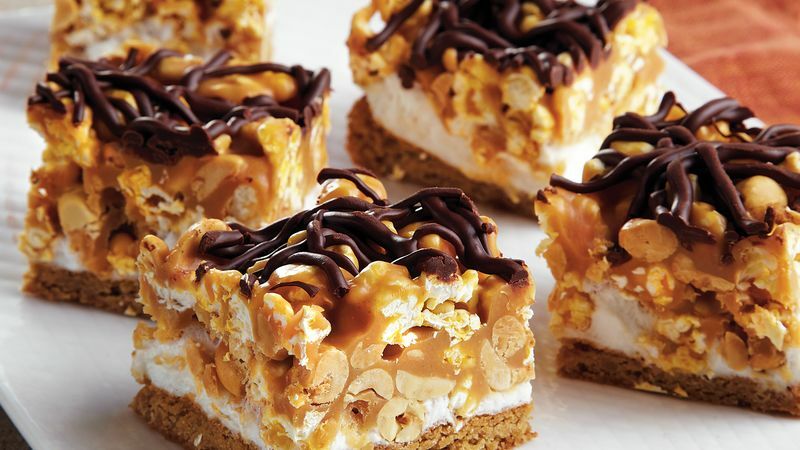 Popcorn and peanuts are the star ingredients in these bars. A gooey marshmallow layer holds it all together.